Fire blowing is always a highlight of any show. This external vertical explosion will stop an audience in its tracks. This trick commands attention to the stage and with the blink of an eye, it is over. Not only does it leave a searing impression, it shows an audience that the dancer is in control and it is in your best interest to pay attention. 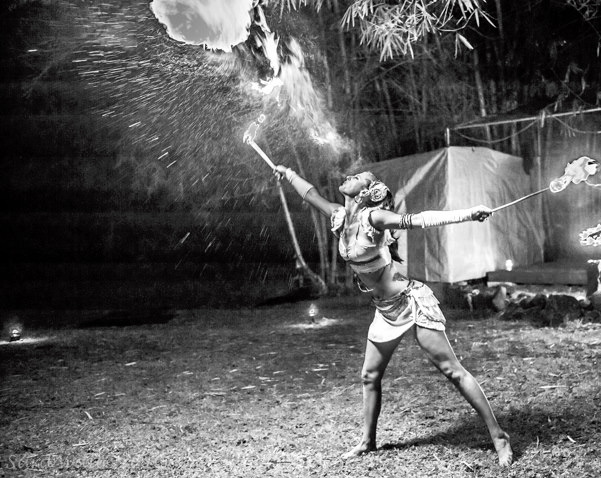 Fire blowing is serious business and it takes serious dedication to perfect this talent. Even the most professional dancers get hurt, however, this is why an elemental connection to your surroundings is of the utmost importance. Fire Breathing, eating or blowing is no joke when it comes to exhaling fuel. Although there is an apparent danger factor, a trained dancer knows how to determine if the scenario is appropriate. Fire Eating is a bit subtler and allows for the performer to draw the audience in a little closer. Although the trick involves consuming flames, a trained dancer has a practiced technique that keeps them safe. Fire Eating creates a shock factor to the audience, as the flames literally make contact with ones tongue and lips and sometimes are perceived as burning. This also takes a tremendous amount of practice to perfect the technique and it is encouraged to have a mentor for such activities.